The web has put a wealth of information at our fingertips. The trouble is, all too often that information is misleading, or even hands-down wrong. Nowhere is the pseudo-scientific babble more fetid and fertile than in the world of tube guitar amps, where players have long sought mythical ingredients that will make their own rigs just a little more magical than those of the guys who’ll be up on stage in the set that follows. Many of us discovered years ago that different components can and will make a difference in how our amps sound, but for many amp nuts that awareness has become a siren’s call to root out an entire signal-chain’s worth of golden fixes which, when strung together, will guarantee the tone of the gods. One guy notes, for example, that his amp sounds extremely good and uses a particular make of signal capacitor. A second guy pontificates about the magic properties of those parts, even though he hasn’t tried them for himself. A third guy buys enough of the caps in question to “upgrade” his entire amp and, after making the investment and the effort, he feels obliged to rave on the amp forums about what a huge difference it made to his tone. And the myth perpetuates. It’s a familiar cycle, and if you pay any attention to the buzz on the gear forums, you’ve probably seen plenty of it. How do we cut through the myth, the hyperbole and the pure B.S.? There’s no better route than going straight to the makers who stake their livings and reputations on the amps that they build. While some manufacturers will use “buzz of the month” parts as selling points to hype their wares (regardless of any underlying reality regarding tone and performance), each of the makers quoted here is a straight shooter who has put in the hard graft to find out what really works towards the goal of producing purely great-sounding and long-wearing tube amps. I asked each of them directly about tube-amp myths they’d personally like to help debunk in the course of writing The Guitar Amp Handbook (and the recently-released Updated And Expanded Edition), and each took the issue at face value, without any concerns for PR or self-serving prevarication. I should also add, however, that - having probed inside amps made by each of these builders — they are all using parts of perfectly good quality, none of what they say should be taken as cover for using cheap components to save money. Let’s see what they have to say. The Myth: The most expensive parts make the best amps. The Makers: While quality components are clearly important, most makers agree that you need to know why you’re using a part in any given position, and simply stringing together the most expensive components you can acquire doesn’t always yield the best results. 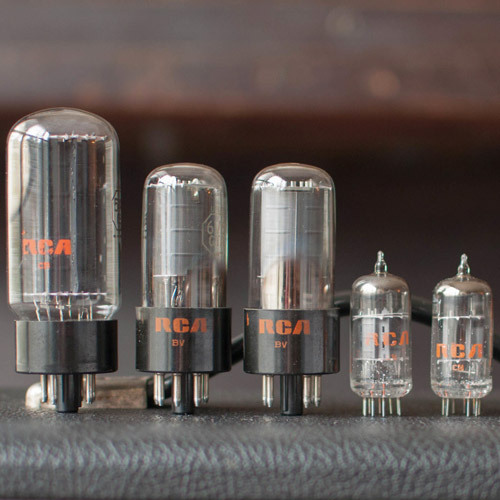 The Myth: Hotter preamp tubes make your amp sound better. The Makers: A lot of players feel that a higher-gain 12AX7 in their first preamp position must be a good thing, equating more gain with more goodness. Sometimes swapping to a high-gain 12AX7 does fit the bill for certain sounds, but in many situations you can actually find improvements in tone and dynamics by going the other way. “When you drive a signal into clipping [as high-gain preamp tubes do], you lose a lot of information,” says Mark Baier of Victoria Amp Company. “The use of a 12AY7 in the front end [a lower-gain tube that’s a direct replacement for a 12AX7], which maintains integrity for the next stage, and other things, all contribute to avoiding clipping that signal too soon. For me, it all has to do with understanding that when you pick a note on a guitar, you’re creating a signal voltage that can be seen at the grid of that first tube. Varying the signal voltage can have a profound effect on the attack and dynamics of [most classic tube] amps.” Furthermore, Baier continues, a lower-gain tube makes it easier to get those dynamics working for you, whereas the higher-gain tube often slams the next stage with an all-or-nothing signal that clips too soon within the amp’s signal chain. Many notable players have achieved this with other lower-gain tube types, the late Stevie Ray Vaughan for one, who often used a 5751 (somewhere between a 12AY7 and a 12AX7 gain-wise) in his amps’ first position. 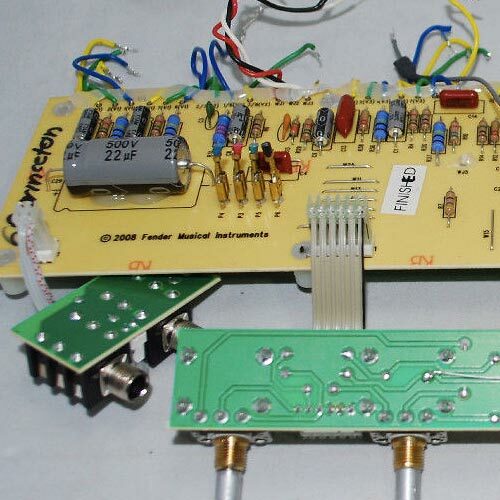 The Myth: Hand-wired circuits will always sound better than printed circuit boards. 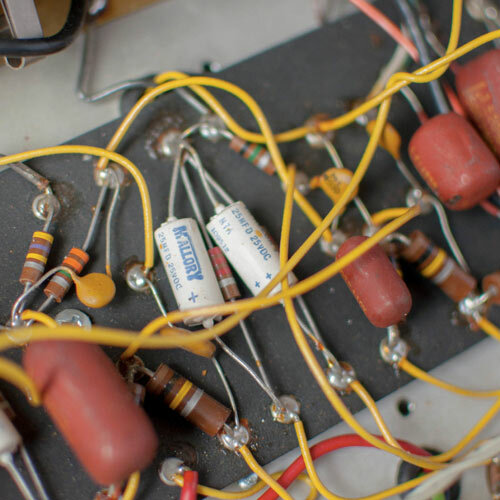 The Makers: The labor intensity of building hand-wired amps, whether truly point-to-point or using hand-wired eyelet or turret boards, means that these often cost more than amps built with printed circuit boards (PCBs). This in itself seems to imply a superiority of tone. The thoughtful amp maker will tell you, however, that a lot depends on how and why you’re using a PCB in your design. The Myth: One “magic” part can make all the difference. 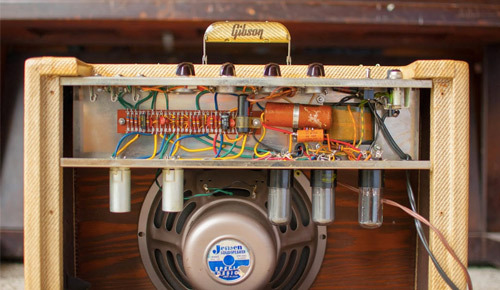 The Makers: Most makers acknowledge that it would be great and life would be easier for them if they could plug in one magical part and make an amp instantly sound astounding. The reality, though, is at the other end of the spectrum. It’s the way that all parts work together that matters, and sometimes the individual components that do the best job will surprise you. The Makers: On one hand, an extremely tidy wiring job might imply conscientious work in general, and that in itself is a good thing. But pure neatness in and of itself does not a toneful amp make.